The ruins of Quilmes can be reached from Cafayate (Salta) or from the Tucuman village of Tafi del Valle. The destination is simply spectacular, unique, majestic. At first glance, the morning sun shows a great mountain that has different marks and footprints than the rest of the mountains. You just have to get closer to see what it is and when the human eye gets to see them well, the picture changes completely. The ruins of Quilmes, as they are popularly known, located in the northwest of Argentina, belonged to the Calchaquíes Indians, who were located on the slopes of these mountain ranges and on the mountainous cord called Calchaquí; Hence the name of these tribes: quilmes and calchaquíes. The huge mountain that appears from a story is a stone fortress; The corrals and cactus served for the habitual development of these communities that raised animals and they planted quinoa, maize and other plantations that served to feed their people. The highest part of what we now call ruins was the place chosen for defense before the enemy. First were other tribes and finally, the Spanish conquistadors, who came here and found a strong resistance until they succeeded. A gravel road places us at the foot of Mount Alto del Rey, where this imposing city rises that will not let any of its former inhabitants be seen. Only, and luckily, the visitor can find some vestiges of what was this civilization, like arrowheads, stone axes or ceramics. Between 5,200 and 4,500 meters above sea level, the ground is stony but loose and immature. This region is cold and with a thermal amplitude of very opposite extremes, little precipitations and enough snow and hail throughout the year. Here, the predominant plant formation is the grass steppe. Between 4,500 and 3,500 meters, there is a cold and dry climate with a great thermal amplitude and poor soil in terms of organic matter, rocky and sandy soils with a high content of salts and sulfur. Small shrubs and lots of uncovered floor space. Among the herbaceous species are plants with thorny branches and some yellowish flowers. Between 3,500 and 2,000 meters high, it is possible to observe a great abundance of columnar cactaceae and bromeliads, among other species. Within this biome, stony and sandy soils predominate, which practically do not present humus and that during the whole year, with the exception of the summer, they hardly receive precipitations. Here, the cardones find their place in the world. They reach heights of between five and seven meters, although they have been colonies that surpass the ten meters of height. These cacti have characteristics that are worth highlighting. There are specimens that far surpass the 300 years of life. Its trunk is covered with thorns about twenty centimeters long orange-yellow, almost golden, which are used by locals to weave flame wool. These enormous cacti reach reproductive maturity only between about forty and fifty years of life, when for the first time they generate their characteristic white flowers. From these is born the fruit that will give rise to the seeds from which new cactus or cardones will be born. Its usefulness as wood is multiple, but it is only used of cacti that are dead and / or dry. Cutting them green is a crime that is legally punished. Below 2,000 meters, the vegetation is abundant, with spiny plants of low height. 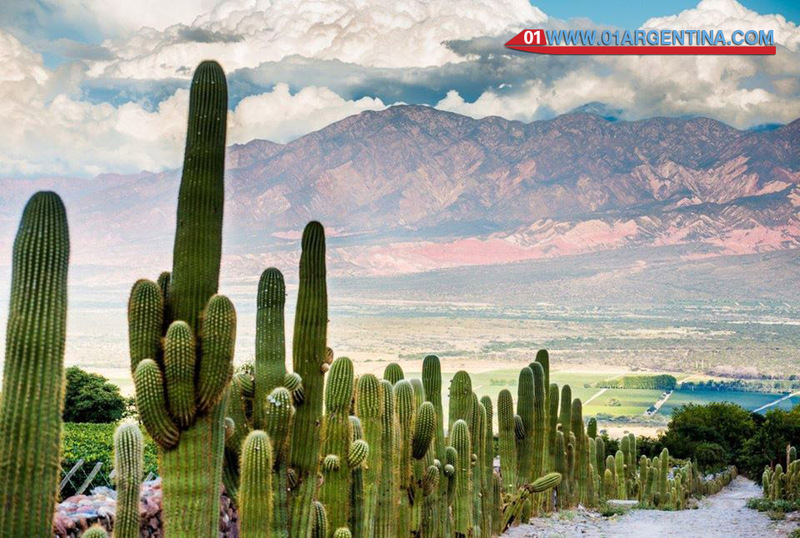 The presence of cactus or cardon is only beginning to be noticed as we gain altitude in the terrain. Here, the predominant in the stony soils is the crawling cactus or tuna, which crawls across the land as if they are barbed and which gives the landscape an opaque green rather than striking color. Different legends and popular beliefs have told the origin of the immense colonies of cardones that are found throughout the North of Argentina. There has even been talk of the character of these plants, putting them to the mote of sad, simply because they remain static, immobile.